Last Thursday I stopped by Norton’s Produce at 39W369 Illinois Route 64 in Saint Charles. I had visited Norton’s as a customer in the past, most recently over Memorial Day weekend. It was then that I chatted with Benn Norton and invited myself over for an interview and photos. Benn kindly obliged. I drove like a maniac from the day job to arrive at 6:00 p.m. for our scheduled appointment. The produce stand I walked up to was empty. Hunh? It was there last week. Benn was beginning to close up shop and found me standing there a bit perplexed. It turns out he just moved the produce into a neat, clean retail room in the barn. This room had been a store back when the farm made their own brand of feed, so it’s being recycled. The crazy storms we have had in Illinois this year have driven Ben to seek shelter in the barn. He said there have been days this spring when gusts of wind sent produce flying and he can’t take it anymore. Understandable. It’s been a violent spring in the midwest! It was a few minutes after 6:00 when Benn realized he’d neglected to take the “OPEN” sign down. My arrival had created a distraction, just long enough for 3 customers to slip in past closing time to shop for peas, strawberries, and asparagus. After they left, we began talking about the hours and Benn said he is going to stay open later after the July 4th weekend. I told Benn how I and most of my friends commuted to and from corporate jobs in distant municipalities. There is no way we can make it back to the area by 5:00. In fact it’s closer to 6:30 most days. He thought it might be worth a try to lure a few more customers in on their way home from work, so check the schedule before you assume closing time is 5:00! After Benn helped his latecomers, I asked to be shown around. I had read the entire Norton’s Produce web site and had a feel for the place, but when people show you around a family farm that has been around since 1846, you learn a lot more. I like that aspect of interviewing family farmers. We started by talking about the barn we were in; the old feed store/new produce shop. The existing barn was built in 1967 after the original was obliterated by a tornado. Way back when, it housed 30 head of cattle. It’s now used for the shop and for drying corn for one of the two things that make Norton’s different: popcorn and honey! More on those in a bit. Next we walked over to the building that housed the produce stand until last week. Benn’s Mom opened the produce stand when she retired from teaching in 1992. (Good idea, Mom!) Each Tuesday and Thursday, all unsold produce is delivered to the Salvation Army in Geneva, Illinois. That is a tradition Mom Norton began years and years ago, and it has been carried out since. (I think I would like Mrs. Norton.) Benn showed me into another barn, this one dark and cooler. There were big sinks and tables for sorting and washing vegetables and fruit, as well as a giant walk-in cooler that is too big to move. Ever. It’s used to hold crops from the field when they’re harvested. I asked if Benn had ever thought of serving ice cold watermelon out of that cooler to families visiting on hot summer days. He’s got a couple of tables and chairs set up. Alas, the health department requires hot water if you sell “prepared foods” but he can give away free samples of popcorn and such. I guess I never thought of sliced watermelon as “prepared” but the health department does. Another challenge the small farm faces. Behind that barn, I was introduced to a couple of “summer” goats that live at Norton’s during the warm months. They stay on another farm in a herd during the winter. 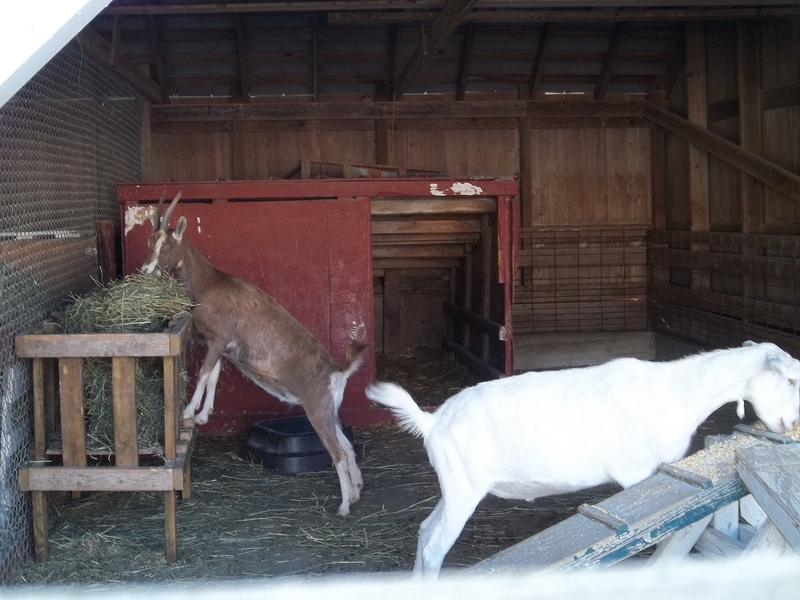 The goats were in a pen and got excited when we walked up. Supper time. Benn opened the pen to throw in some food – one likes hay, the other likes corn – and both escaped. They didn’t go far and a snack brought them back. He said they escape whenever they get the chance, but he lures them back quickly due to coyote traffic. (We have coyote traffic at our house too, so I know what that is like.) Speaking of living somewhere else in the winter, Benn closes up shop for the frozen months and heads for the sunny beaches of Florida. In fact, Benn was score keeper and statistician for the Fort Myers Miracle for ten years — the farm team for the Minnesota Twins. (Farm team… how appropriate!) He has a home in Fort Myers as a result, and escapes the frozen midwest for several months each year. Smart guy. On to the greenhouses. There were eight in a row, good-sized and wide. This year, the decision was made to put tomatos into the ground inside greenhouses. 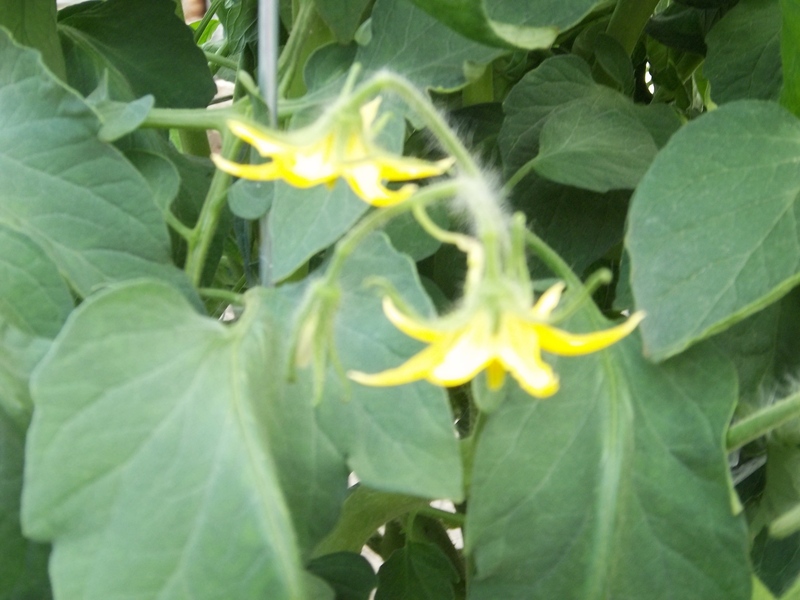 As a result, Norton’s has 3′ tall tomato plants in full bloom in mid-June. This means tomatos before August. Yahoo! Tomato plants cheer me, no matter where they are. Deep folds in fuzzy green leaves, the distintive smell of the foliage, bright little stars as blooms. And we all know what comes after that! Big scarlet, earthy, fruit that drips down your chin when you take a bite. (Unless you are more civilized than I and use a plate and silver service.) The field tomatoes didn’t get put in the ground until a month later, thanks to a chilly spring. They’ll produce later and keep us supplied into September if we’re lucky. In addition to the tomatos, the Norton family grows corn and soybeans, some here on the Route 64 property and some on land owned by a friend. 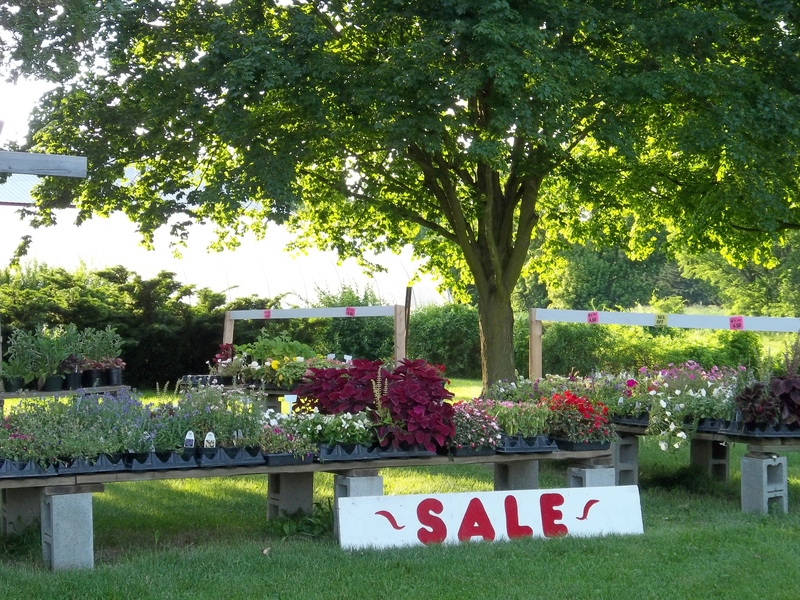 There are perennials and annuals and herbs for gardeners in the spring and early summer. This has been a rough spring for sales; the third wettest in Illinois history. In autumn, Norton’s has a pumpkin patch and a grassy field full of activities for kids. There is a petting zoo for special events. Norton Farm welcomes field trips, too. Let your teacher friends know about that. 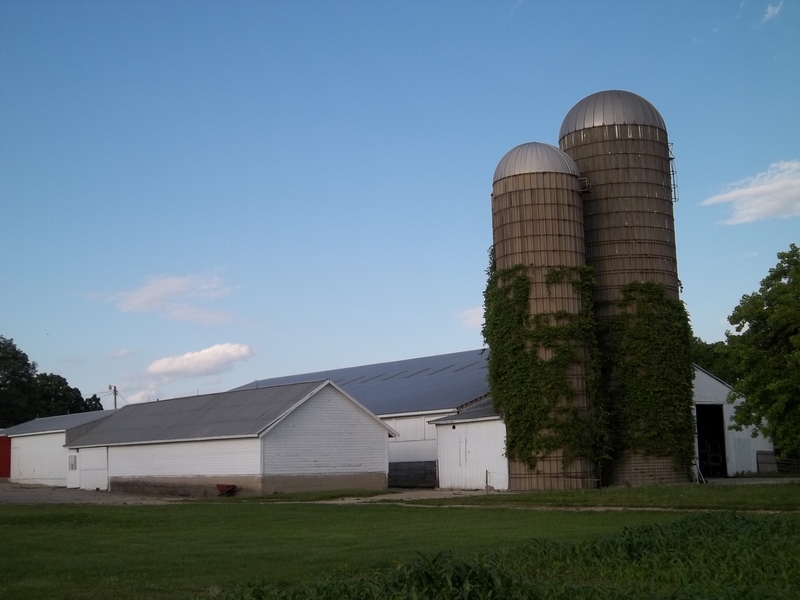 Behind the greenhouses, various fields – tomatos, pumpkins, and corn. The land immediately behind the barns is still Norton land, but the 80 acres beyond that was sold off in the ’90s. It’s yet to be developed, which is nice. Then there was the Holiday Lodge! Christmas central in a building with nice glass sliding doors for light. Benn said he loves to bake. In the weeks before Christmas, he has a big screen TV playing holiday movies, Christmas trees, greenery, and LOTS of cupcakes and coffee for shoppers. Benn said he had heaters galore, and decorations and food to offer. (This does not happen every year, so check before you head out into a blizzard.) 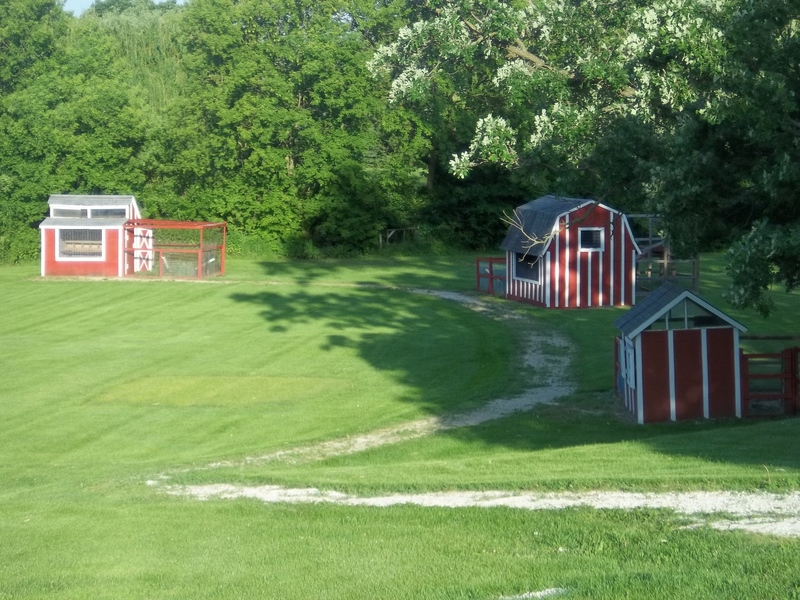 The Norton’s have an advantage – several solid barns and outbuildings that can be used for a variety of attractions. I asked Benn who else helps on the farm. He said his sister Jan did for years, but she has moved south to Peoria. Another sister, Beth, lives nearby and her daughters help here and there. 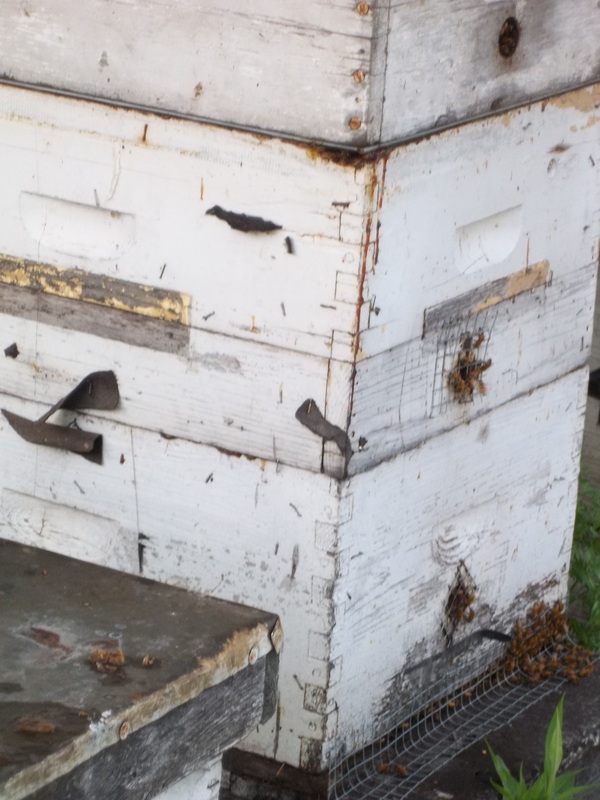 Brother-in-law Reid Root is the keeper of the bees. BEES! I asked (maybe begged would be a better word) to be carted out a muddy track to the hives. We hopped into a golf cart and four-wheeled out to them. I took a few photos and learned that the honey for sale in the shop is from the farm. I bought some to try and I will let you know when I’ve tasted this liquid gold. Love me some local honey. Back to the shop. I picked up 5 tomatos (brought up from a Florida farm), a jar of dilled brussel sprouts, fresh-picked strawberries, honey, and corn-on-the-cob popcorn. (The dilled brussel sprouts and tomatos were both excellent. Love that Early Girl!) 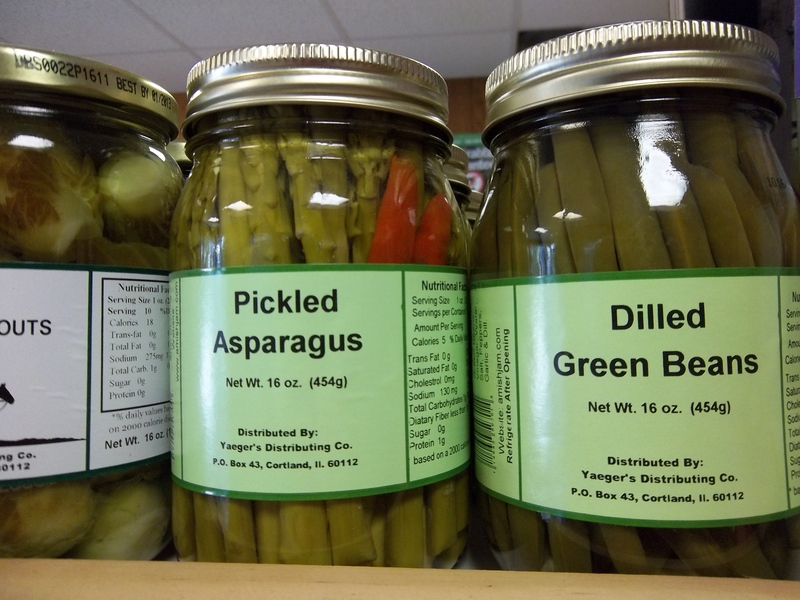 The Norton’s carry a full line of Amish canned goods: several salsas, big beets, baby beets, corn relish, pickle relish, pickled asparagus, dilled green beans and brussel sprouts, and honey in various size jars. Blueberry pie filling, too. Benn popped a bag of “corn on the cob” for me. They sell popcorn two ways, actually. Last year’s corn hangs in the rafters drying in its effort to make the popcorn grade. There are some dry ears hanging by twine-wrapped husks in the shop, and jars and plastic containers of REAL popcorn. Do you remember the kind of popcorn you make in a pot, not the microwave? Cover the bottom of a heavy pot with oil and turn on the heat. Put some butter and salt in a second pan on low. When you think the oil temprature is just right in the bigger pot, drop in a kernel or two. When it’s time, they’ll pop quickly and hit the lid from inside. BE QUICK! 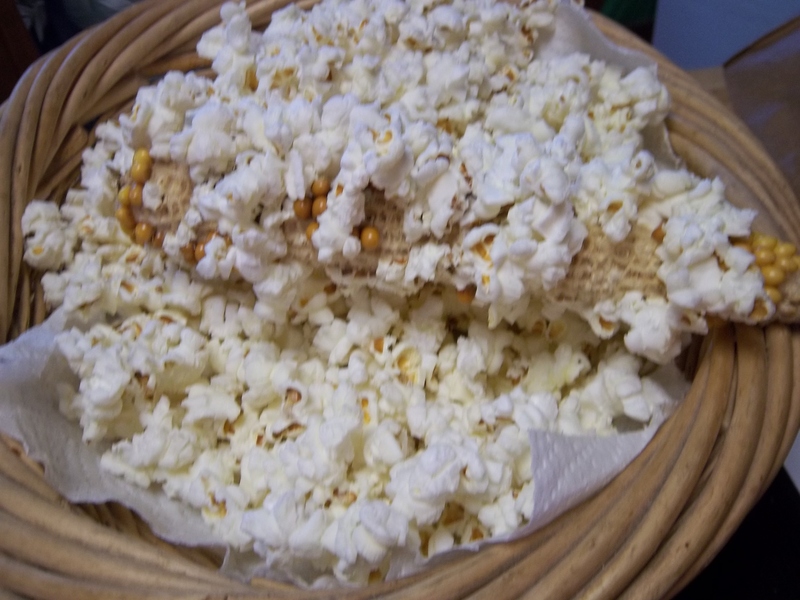 Take the cover off, dump the kernels in, and POP! POP! POP! In the beginning, it’s slow and as the heat builds, the staccato pop begins and it goes crazy fast for a few minutes. Keep the pot moving! Don’t stop! Don’t let it burn! Keep it moving! When the pop-pop…. pop……. pop…….pop slows down, you take it off the heat. Pour that yummy, salty butter over the corn… Mmmmm. I just had a flashback to the time before microwaved popcorn. The second way was new to me! An full ear of dried corn is placed in a paper bag. (The bag is the size you use for lunch if lunch only a peanut butter sandwich and a baggie full of chips.) 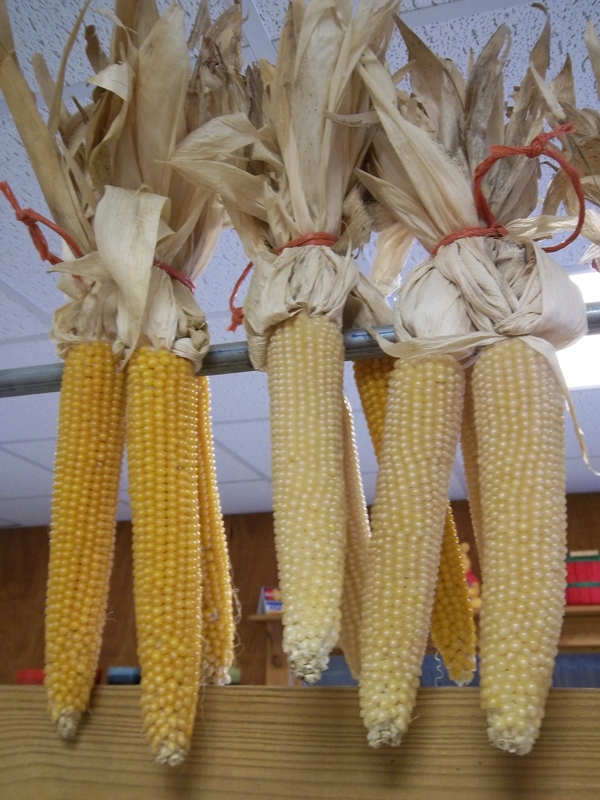 The husk of the corn is pulled back from the ear – so the husk is outside the bag and the ear is inside the bag. The whole deal goes into the microwave. It doesn’t take long – suddenly you have a bag of popped corn, light and fluffy! Pour it into a bowl, shake and push what’s left off the cob and chow down. I think you should have that little pan of salty butter ready for this version, too. The product is sold as one ear of corn in the paper bag, with instructions for a very low price. I can only imagine how much fun this little science program would be for the little ones. Heck I had fun with it and I’m… Well, I’m older. Benn had promised to take some neices and nephews out for dinner, so had to keep moving. My tour concluded. I enjoyed my visit, and I think you will, too. If you live nearby, help me support those extended hours so I have time to leave work and pick up produce on the way home! Call or check the web site first, to verify hours. Go now for the popcorn and produce, and in the fall for the apples and kiddie land farm. I think I will go back then, too. It looks like fun! Do look around, Kelly! You will be amazed! Apple pie doesn’t sound too bad… Mmm.